The Toysmith Children's Stainless Steel Cookware 5pc Gift Set is on sale for $16.99 at Amazon right now. That's 58% off the list price of $39.99! Great gift idea, presented in gift box as pictured. 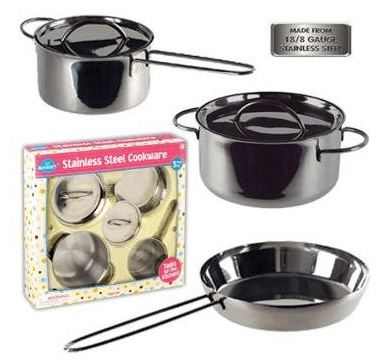 Children's Stainless Steel Cookware Set 5 Pc. Gift Set including Sauté Pan, Stock Pot and Sauce Pan. Serving utensils are not included. Set includes a lid for the Sauce Pan and a lid that fits both the Saute Pan and Stock Pot. This professional quality cookware is made of dishwasher-safe stainless steel. Sauté pan and stock pot are 4.75″ diameter, sauce pan is 3.75″ diameter.